Location: Triangle Rock Club (North Raleigh location). Participants will meet daily for a prompt 9:00 a.m. departure from the Gonet Gateway. Transportation to Triangle Rock Club will be provided in a Ravenscroft School Bus. Afternoon pick up will occur in the same location at approximately 4:00 p.m. Description: TRC's Climbing Camp is a week-long, full day camp for ages 6-12. No prior experience and/or equipment is necessary. 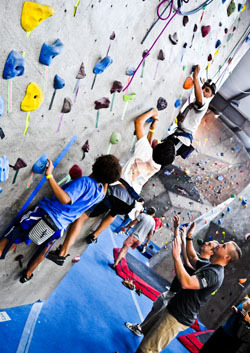 The knowledgeable staff facilitates climbing and games, while teaching basic climbing skills. Climbing camps provide an adventure for that's perfect for kids because once they complete one course there is always another challenge on the next wall. Climbing build more than physical fitness; problem-solving on their walls instills character lessons, courage and confidence. At the same time, partnerships with fellow participants will help to encourage teamwork and sportsmanship. Ravenscroft is proud to have partnered with with TRC for the past five years to provide this unique and dynamic program. What to Bring: Participants should wear comfortable athletic clothing, sturdy shoes, and a bagged lunch with additional snacks. Instructors: All TRC staff members are dedicated to providing the best instruction, programs and terrain to everyone, from beginners to world-class climbers. They do so in a safe, professional, and fun environment at the largest indoor climbing facility in North Carolina.